•Check Catchment ID and then select how you want to number each catchment. 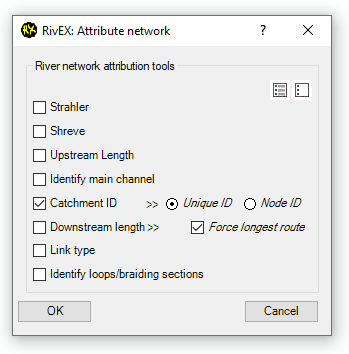 It can be unique starting at 1 (default) or the node ID of the mouth node of the catchment. Using the force longest route option (which is default, but can be turned off) can significantly influence the output. To understand the implications click here for more information. Click OK to start the catchment ID process. •Assigning polylines a catchment ID will allow rapid analyse of your data, based upon the ID rather than a spatial relationship. For example you could group your data by catchment and sum the river lengths by stream order as a simple query in MS Access. •A catchment is defined as a set of connected polylines that flow to a single node (the mouth). Thus small catchments that flow to a sink hole and appear to be small disconnected catchments will be treated as an individual catchment. 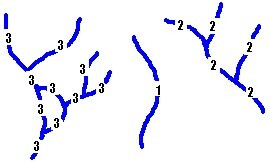 •In the image below river catchments are identified and assigned unique numbers. •The number used for the catchment ID can be an incremental counter or the ID number of the mouth node. •The output of this process is a new column in the attribute table of your network called CatchID. •Examine the image below for a situation that can occur within river networks. Here we have two catchments that join each other by a link as indicated by the arrow. 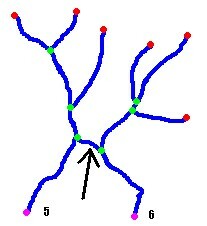 Depending upon the orientation of the link most of the polylines will fall within one catchment even though in the real world the link is probably nothing more than a small drain with periodic flow. •Removing the link completely or breaking its topological connection at one of its nodes will ensure the rest of the polylines are attributed with correct catchment IDs.